It was a moment of jest, but also a moment of truth — one Fletcher widely acknowledged when it was his turn at the podium. The Wild has just four picks in this year’s draft — a first, a fourth and two seventh-rounders — after trading several picks in earlier mid-year deals. While saying it’s not ideal overall and “disappointing for scouts” to have so few chances at landing potential impact players, Fletcher said he’s comfortable with the number of picks the organization has. 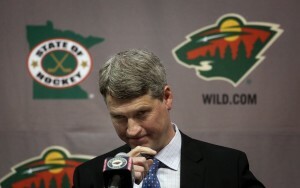 The Wild figures to get a potential difference-maker at No. 15 overall, but Fletcher did not sound overly eager to add any more picks via trades. * If there was an overriding message from Fletcher, though, it was this one: “Everything has to be on the table coming off the season we just had.” He said that in the context of a discussion about trades, free agency and potential buyouts.